Smoked Chicken and Mango Quesadilla - 452kcals and 21.4g fat per serving. In a bowl mix together the grated cheese, soft cheese, spring onions and jalapeños. Lay the tortillas out on a surface then spread them with the mixture. Top one with the chicken and mango, then sandwich together. To make the guacamole place the flesh of the avocado into a mortar or a small bowl and with the pestle or the back of a fork mash the avocado until its smooth with a few chinks. Pour over the lime and salt and mix together, then add the rest of the ingredients and stir. For the salsa, simply mix all the ingredients together. This will definitely be thankful for 20 minutes for the flavours to blend. Heat a frying pan until it’s hot, and then lay the quesadilla on top. Gently toast for two minutes on each side or until golden and the cheese is beginning to ooze. 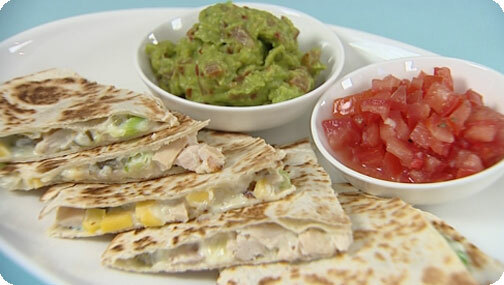 Transfer onto a chopping board then cut the quesadilla into 4-6 wedges and serve piping hot with guac and salsa!